This Spotify exclusive was released at midnight on December 12, 2017 and features U2 performing two tracks, “The Little Things That Give You Away” and a cover of Marvin Gaye’s “What’s Going On”, both recorded at Neptune Studios in Los Angeles, California. The songs are released under the title “Spotify Singles.” The total release is 8:58 in length with the two songs. The release can be found at https://open.spotify.com/album/3VJRDS3Xv9kAE8NLA9rHX1. The cover of the release is black with the silhouette of Eli and Sian used for the main album in blue and black. 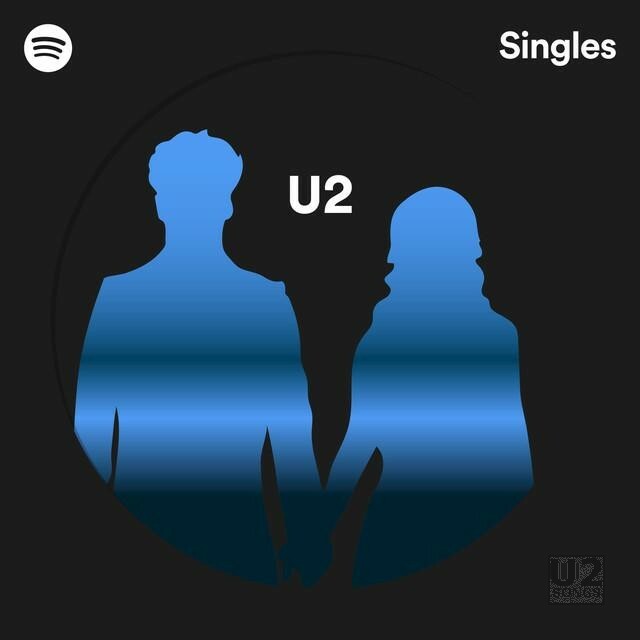 The image is a circle in the center of the image, and the Spotify logo and the word “Singles” is added outside the circle. Inside the circle is “U2”. “Spotify Singles” is a series of recordings on the Spotify streaming service, introduced in November 2016. In “Spotify Singles” two songs are recorded by an artist, without a crowd being present. The inaugural singles launched on the site were by John Legend, D.R.A.M, Tove Lo, The Naked And Famous, Grouplove, LEON, Local Natives, Aoife O’Donovan, Coast Modern, Hamilton Leithauser, Juanes, Lewis Del Mar, Margaret Glaspy, Shovels & Rope, Spencer Ludwig, GRiZ, Andrew Bird, Caitlyn Smith, Lindsey Stirling, Kaleo, and Esperanza Spalding. All of the “Spotify Singles” are released with information about the recording studio. Most are recorded at the Spotify Studios in New York, although recordsing have also been done in Nashville, London, and U2’s session was recorded in Los Angeles. U2’s session is the 118th recording in this series. All 118 (236 songs) are also available in one playlist called “Spotify Sessions: Singles”. “The Little Things That Give You Away” is done more like U2 have been performing the song live in concert. The lyrics are slightly rearranged from the studio version in this version. The studio version of the song was released on Songs of Experience, and U2.Com has also hosted a streaming live performance of the song, recorded in Seattle on May 14, 2017. And although this is the first time the band has released a full version of “What’s Going On”, Bono and The Edge both contributed to a 2001 effort where a number of artists recorded a variety of versions of the song. Bono lead the project, which was released under the name, Artists Against AIDS. Another performer on that version of the song, Gwen Stefani, often would join U2 on stage to perform the song with them during the fall leg of the 2001 Elevation tour.